Odd Sundays presents Lynn Davies and Sarah Xerar Murphy this Sunday, March 20. 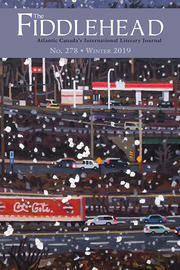 Qwerty Reads presents Naomi K. Lewis, Odd Sundays presents Shari Andrews and Fiddlehead fiction editor Gerard Beirne, and UNB celebrates the launch of three books: Phillip Crymble's Not Even Laughter, Gerard Beirne's In a Time of Drought and Hunger, and R.W. Gray's Entropic. Congratulations to Fiddlehead editors Ian LeTourneau, Rebecca Salazar, Gerard Beirne, and contributor Danny Jacobs on their recent successes. The Canada Council for the Arts, The University of New Brunswick, The Fiddlehead, and the UNB Bookstore are pleased to invite you to a literary reading by celebrated poet Rita Wong on Thursday, February 11, 2016 at 8 pm in the East Gallery of Memorial Hall on the Fredericton Campus. "odd sundays" resumes on January 31st when we welcome Fredericton Gender Minority Group members Reid Lodge, AJ Ripley, and Rhys Humphries as our featured readers.